I would think that the name will change and the agreement will be carried out. The good news from this merger is the corporate headquarters is moving to Charlotte. Thats should give the new combined bank an incentive to continue to support local colleges. What signage goes up on the outside doesn't matter as long as their checks keep coming and their support doesn't decline. Hey, us oldheads Aggies will continue calling it Aggie Stadium no matter what signage they slap on it! Hey I went through over 100 bank mergers before I retired from banking and I learned one lesson... pay no attention to what "they say" after the merger. It's all PR bullsiht! Once the press dies down and the ink on the agreement dries, a lot will change. If you don't believe me, ask any former employee of Wachovia that went through the Wells Fargo merger! As I said earlier, the good news to us is the headquarters will move to Charlotte so I expect their (small) financial commitment to us will not change. Who knows... the executives that were based in Atlanta with SunTrust may think that having a presence on the nation's largest HBCU is a much bigger deal than BB&T thought. Only time will tell. A contract extension announced in 2015 gives Greensboro's PGA Tour event sponsorship from Wyndham Worldwide and BB&T through 2026. From left, Bobby Long, chairman of the Piedmont Triad Charitable Foundation; Stephen Holmes, chairman of Wyndham Worldwide; Tim Finchem, PGA Tour commissioner; Steven B. Wiggs, senior executive vice president and chief marketing officer, BB&T Corp.; and Mark Brazil, Wyndham Championship tournament director. The announcement that BB&T and SunTrust banks will merge sent shockwaves through the banking industry and the Southeast, and it stretched to include the world of sports. The bank, which came to Greensboro in 1983 and Winston-Salem in 1984, is the second-biggest sponsor of the PGA Tour’s Greensboro event, the Wyndham Championship. BB&T and the tournament are entering the third year of a 10-year contract that expires after the 2026 tournament and runs concurrently with Wyndham’s sponsorship. The agreement has been part of a regional vision and growth strategy championed by the Piedmont Triad Charitable Foundation, which manages the event. “BB&T is a major player (in this region) and I feel like they’ll continue to be one,” Brazil said Thursday. 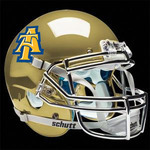 Most recently, BB&T acquired the naming rights to A&T’s football stadium. The stadium is named BB&T Stadium, and it was a move in 2018 that broadened the variety beyond A&T’s flagship football program that has won consecutive HBCU national championships. BB&T's name is attached to several stadiums and venues, the majority of which are in North Carolina. The company will merge with SunTrust, which holds the naming rights to the Atlanta Braves’ stadium that opened two years ago. David White, a BB&T spokesman, said that, because the deal was just announced, “there are many, many details to be worked out” and that the bank wouldn’t have further detail to share before the end of the day. BB&T also holds the naming rights to Wake Forest University’s football stadium (BB&T Field) and the minor-league baseball stadium (BB&T Ballpark), home of the Winston-Salem Dash. BB&T owns naming rights to two other baseball stadiums in the state — Charlotte’s BB&T Ballpark, which is the home of the Knights, the White Sox Class AAA affiliate, and High Point’s BB&T Point, on which construction is nearing completion. The High Point stadium will be the home of the Rockers, an independent-league team. Two recreational soccer facilities, BB&T Sports Park in Bermuda Run and BB&T Soccer Complex in Browns Summit, provide additional variety for the bank. Along with numerous stadium sponsorships across the state, the bank is also one of four title sponsors for the Winston-Salem Open tennis tournament held each August at the Wake Forest Tennis Complex. Outside of North Carolina, BB&T’s name is attached to: Northern Kentucky’s basketball venue (BB&T Arena), the second-oldest minor-league baseball stadium in the country in Williamsport, Pa. (BB&T Ballpark at Historic Bowman Field), and the home of the NHL’s Florida Panthers in Sunrise, Fla. (BB&T Center). SunTrust doesn’t have its name on nearly as many stadiums, but the one it does is a massive one: the Atlanta Braves and the bank reached a deal in 2015 for the team’s new stadium to be SunTrust Park, which opened in 2017. According to the Atlanta Journal-Constitution, the 25-year deal is worth more than $10 million per year and includes the bank holding an exclusive presence throughout the surrounding area of the stadium.